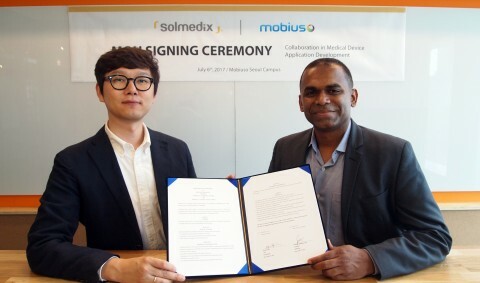 SEOUL--(Korea Newswire) July 07, 2017 -- Solmedix Co., Ltd announced that Solmedix (CEO Yang In-chul, Seoul, Korea) and Mobiuso LLC (President Santhosh Kumaraswamy, New York, United State) signed an MOU for joint development of software and mutual business cooperation for the MOSAIC platform, an innovative medical device development system. Under the agreement, both organizations will propose solutions for novel medical device development and jointly develop software for building an effective product development platform. Through this joint development agreement, an innovative platform will be developed to support the commercialization of novel medical devices that reflect the needs of the clinical staff. The system has been systematically conceived to commercialize ideas including professional blind test of ideas, R&D and project management to accelerate development. In addition, the system will be flexible enough to support agile iterative development and also support big data and machine learning based analytics. Mobiuso is a healthcare focused app / web / cloud / IoT / big data / artificial intelligence and machine learning solution company. Mobiuso has delivered solutions for Fortune 100 companies and startups from across the world meeting their exacting needs in record time. Mobiuso is headquartered in Marlborough, Massachusetts, USA with offices in New York & Marlborough, USA, Mumbai & Ahmedabad, India and Seoul, South Korea.